This week, the Sunday following Easter Day, has us thinking about Thomas the doubting disciple. Here’s my sermon. As a child I was hopeless at sport – sport was simply not my thing. The best I ever managed at secondary school was the report in my first year where the sports master had written for Gym: He has absolutely no aptitude for this subject but he tries his best. I was the one nobody wanted on their team. When I was at primary school we used that iniquitous system of two people being chosen as captains for football, and then they picked their teams. And of course, when it came to choosing who was going to be in your football team it was never going to be me, because I couldn’t play an even half-decent game of football if my life depended on it. I always knew that I wouldn’t get picked but that didn’t make it any easier. There is nothing worse than being left out. Today we think about Thomas. In fact, the gospel reading about Thomas is traditionally used on the Sunday following Easter throughout the Church worldwide. Immediately after the great celebration of resurrection we are thrust into thinking about the doubt and unbelief of Thomas. In the Orthodox Church today is known as “Thomas Sunday”. And yet, as we shall see, this is not just about the inability of Thomas to believe in the risen Jesus, but the inability of all the disciples to emerge from behind their locked doors and embrace the new life that the risen Jesus called them to. You can understand how Thomas felt – everyone else had apparently had this wonderful experience of realising that Jesus was alive again. He had been left out. They were all meeting together and he was the only one not invited to the party. The rest of the team were there – but not Thomas. Perhaps there was a bit of him that thought, “Well, I didn’t want to go to the party anyway!” I have always felt a great deal of sympathy for Thomas. Our gospel reading today is, of course, a familiar one: the disciples, minus Thomas, are cowering fearfully behind locked doors, terrified of reprisals in the wake of Jesus’ crucifixion. Jesus might be risen, but they are still keeping their heads down. When Thomas arrives on the scene he refuses to believe the testimony of the other disciples concerning Jesus’ appearance, saying that only the evidence of his own eyes will convince him. Jesus appears again and offers Thomas the evidence he demands, and Thomas is finally convinced. Because of this incident, Thomas has gone down in history and Christian tradition as “Doubting Thomas” – as if he were the only one of the disciples ever to have had doubts. We know from earlier in this chapter that Mary Magdalene has met with the risen Jesus. Peter and the person that John calls ‘the other disciple’ have seen the empty tomb, but that’s it – they’ve had no actual encounter with Jesus. It’s only Mary – and she has gone back to the others and told them. And in spite of that, in spite of having heard the news that Jesus is risen, here they are hiding behind locked doors! All except Thomas. So perhaps Thomas is here simply repeating the stand taken earlier by all the disciples, in refusing to accept the testimony of others. So what else might be going on here? I started by talking about being the person being left out of the team. Did it, I wonder, feel a bit like that for Thomas? Why would Jesus have chosen to appear to the disciples when Thomas wasn’t with them? Was it that Jesus care as much for Thomas as he did for the others? Why had he been left out – wasn’t he good enough? And so followed the seemingly hurt and childish reaction: “It doesn’t matter what you say – I shan’t believe you! Only if I see with my own eyes…” A traditional reading of this passage sees Thomas as the odd one out – the doubter when everyone else believes. But I don’t think it’s that straightforward. In his love and compassion for Thomas, Jesus appeared again and gave Thomas exactly what he had demanded. Jesus’ gentle rebuke of Thomas “Blessed are those who have not seen and yet have come to believe” is normally read as implying “blessed are those who don’t give in to their doubts, even though they have not seen.” But perhaps it could also be read as comfort for all those who follow Thomas. Thomas is not condemned for his struggle to believe, and nor will we be. He stands as a model to all who have felt doubt but won through. The things is, though, that as I’ve thought and prayed over this passage over the last week I’ve been getting the distinct message that God is saying something to us at Saint John’s – not about Thomas – but about the other disciples and the locked doors. And so there’s another aspect to this story that I want us to think about this morning – the locked doors. For I think the locked doors are the key to what God is saying to us today through this passage from John. 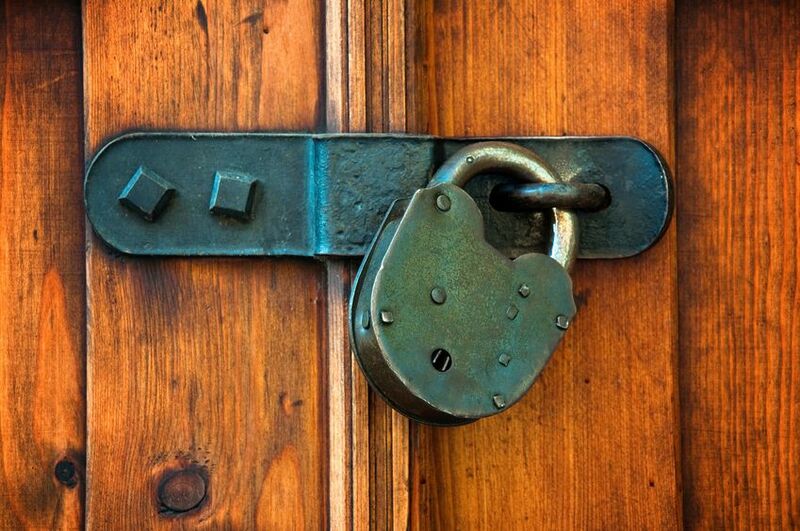 Why were the disciples hiding behind locked doors? We’re told that it was because the disciples were fearful of the Jews. But it seems to me that there’s far more to it than that. After all, if the authorities had been looking for the disciples a locked door was hardly going to get in their way! Had there really been a threat then to avoid arrest or punishment they would have had to have fled from Jerusalem. And if Jesus was really risen, then presumably they might have grasped that they had nothing to fear. There has to be more to this than simple fear of the Jewish authorities. And Thomas isn’t with them. Thomas isn’t hiding away with the others. Thomas is the one who seems not to have been frightened. The others, even though Mary has told them Jesus is alive, are hiding away. Why? Remember that at this point, according to John’s gospel, other than Mary none of the disciples have come face to face with the risen Jesus. They only have Mary’s word that he is alive. It would seem that given the emphasis put on Thomas’s unbelief and unwillingness to accept the testimony of others, that John is telling us this is unique – and that therefore the inference is the other disciples accepted the testimony of Mary. So if, even though they haven’t yet seen Jesus for themselves, they have believed that he is risen, why are they still hiding away? I get the feeling here that it’s not really the Jewish authorities that the disciples are hiding from, though there may have been an element of that. Human nature being what it is, I suspect that they are really hiding from Jesus. We know that they have believed Mary – it’s only Thomas who is marked out as the one who wouldn’t believe the testimony of others. They believe Jesus is alive again. So what was going through their minds? Think about it. With one exception, the disciple Jesus loved – traditionally thought to be John – the other men all deserted Jesus after his arrest and in Peter’s case denied even knowing him. They’d thought it was all over. And I wouldn’t mind taking a bet on what is now going through their heads: ‘We ran away, we deserted him, we denied him, we let him down – what on earth is he going to say to us? He’ll be cross, he’ll tell us off.’ And so they huddle away behind a locked door because they are so worried about having to meet him. They are all rather like a naughty child who might hide away from parents because they are afraid of what punishment might ensue after a misdeed, even though deep down they know their parents still love them in spite of what they have done. Perhaps this was why Thomas wasn’t with them – because he didn’t believe that Jesus was alive he was the one disciple who wasn’t worried about being told off. And yet, of course, Jesus was never going to be stopped by a locked door. He knew exactly where they were, exactly what they were thinking, exactly how to handle them. He comes into the room and says ‘Peace be with you. As the Father has sent me, so I send you … Receive the Holy Spirit.’ He greets them with peace, sends them out to do his work, empowered by the Holy Spirit. And as we know that’s precisely what they did. The existence of the worldwide Church is proof. The experience of Thomas encourages us all to be bold in our faith, and to reach out to God beyond the evidence of our physical senses. Jesus came to bring the disciples out from behind locked doors so they could go out in God’s power and change the world. But first one of them had to reach out and turn the key in the lock so they could walk out into a world waiting to hear the Good News. Jesus wants us to know his peace. Jesus wants us to be filled with the Holy Spirit. And Jesus wants to send us out, just as he sent those first disciples. And yet so many Christians still find themselves behind locked doors. Not locked physical doors, but locked doors all the same. Spiritual doors that we close, and lock, as we hide ourselves away and think that Jesus won’t notice. Doors that have signs on them – signs that say ‘Fear’, or ‘Guilt’, or ‘Doubt’ or even just plain ‘Indifference’, or a thousand other things. Things we think Jesus won’t know about or notice. But he does, of course – and he comes and stands with us inside the locked doors and waits for us to recognise his presence so that he can gently move us on as he did with Thomas and with the others. And he gives us his peace. And he sends us out. And he breathes his Holy Spirit into us. All we have to do is accept all that – and reach out and turn the key in the lock, open the doors and go out to help Jesus change the world today.